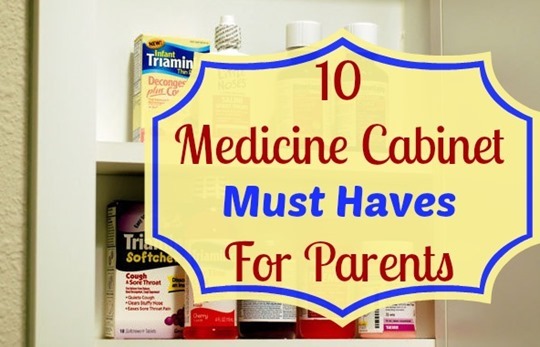 10 Must Have Items For Every Parent's Medicine Cabinet! You are here: Home / Family Living / Household Hacks / 10 Must Have Items For Every Parent’s Medicine Cabinet! 10 Must Have Items For Every Parent’s Medicine Cabinet! As a parent we always want to make sure we are prepared for anything when it comes to our kids. So, I wanted to share this great list of 10 must have items for every parent’s medicine cabinet. When I first had kids I found THE best Doctor. I absolutely loved him, he has since retired. But, he delivered 1 of our kids and took care of our entire family. I love a family Doctor as opposed to a pediatrician and so on. I like that the family Doctor knows the family so they can sometimes trace what caused an issue. Once I thought I was pregnant, and went in for a test and it was negative. I asked the Doctor about it because I was 3 months late. He said “Dian, your Father just died, your Husband is ill, and you have 3 kids. There is plenty of reasons for you not to be regular right now.” He was right, everything soon returned to normal. But, he knew my family and it was just comforting to me to be able to have one Doctor for all of us. When I first started seeing him, he gave me a small book that he wrote for his patients. It was just care instructions he gave often to parents, so he compiled them and they stapled them together with a little copy machine printed cover. I LOVED that book, it was full of things to help you know what to do for any common sicknesses that arise with kids and when to call him. He was very much into “preventative care”. He wanted to make sure you didn’t need him! In fact, at one point his office stopped taking insurance because he said the companies wouldn’t allow him to treat patients well. What’s in your medicine cabinet? What else do you think of as a must have for your medicine cabinet? Great Must-have tips! I’m stopping by from Good Tips Tuesday blog hop. Thanks for stopping by! Yes, we had a mutual trust – I called in on a Sunday with my newborn and said he had an ear infection and he called in the prescription, he knew that I knew what an ear infection was and I didn’t have to go in for an office visit. Last time I went to the Dr. she didn’t come within 10 feet of me. I know exactly what you are talking about. She asked me a few questions and referred me. Everyone is in a hurry! That is another thing, he would come in and sit down and talk to us, we weren’t rushed in and out with no real info exchanged!